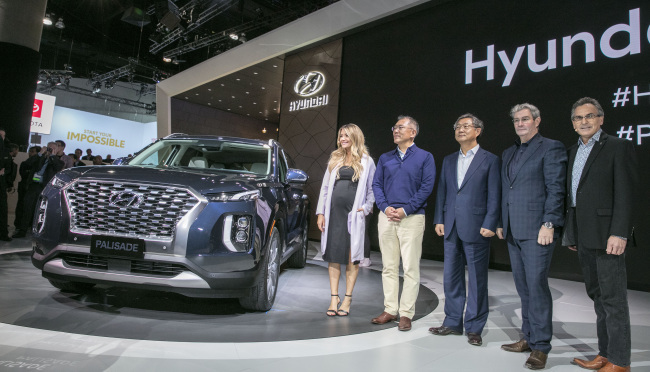 South Korean carmakers Hyundai and Kia have sold a combined 20 million vehicles in the US since entering what is currently the world’s second-largest market 33 years ago. Their accumulated sales marked 20.69 million units as of November, the companies’ data showed. Hyundai entered the market in 1985. Kia, after it was acquired by Hyundai, started selling vehicles there in 1994. By company, Hyundai has sold around 60 percent of the total, or 12.22 million units, while sister affiliate Kia sold about 7.85 million units. The Elantra compact topped the list of the most popular Hyundai-Kia cars, followed by midsized sedan Sonata, sport utility vehicle Santa Fe and SUV Sorento. It took five years for Hyundai to sell the first million vehicles and another 14 years to surpass 5 million. It took 26 years for the two to sell a combined 10 million units. Since 2011, the two have sold more than 1 million units a year, taking only one-third of the time to sell the next 10 million vehicles, the company said. Despite its stellar performance over the years, Hyundai and Kia’s sales in 2018 have fallen 1.2 percent on-year, largely due to a lack of SUV options or new signature brands, as well as fierce market competition. The prospect of the US auto market next year appears positive, but market competition is likely to intensify, the company predicted. The companies plan to intensively promote their new SUVs -- The Palisade by Hyundai and Telluride by Kia -- next year with an aim to expand their presence in the growing SUV market.